The angry partisan wrangling that permeated mainstream media coverage of the health care debate also raged in the blogosphere last week as the issue dominated the online conversation. Supporters and opponents of President Obama’s health care reform goals faced off online, with each side accusing the other of being dishonest and manipulating facts. Liberal bloggers charged that conservatives were spreading fear and falsehoods to weaken support for health care reform while conservatives asserted that liberals were hiding their real goals and were only interested in promoting a government-dominated system. Polarizing commentary is often a part of social media’s attention to current news events. Over the past few months, other hot-button political issues that have led to intense partisan arguments include the debate over torture, Obama’s economic stimulus package, and the resignation of Sarah Palin as governor of Alaska. For the week of August 10-14, almost one quarter (23%) of the top news-related links were to stories about health care according to the New Media Index from the Pew Research Center’s Project for Excellence in Journalism. 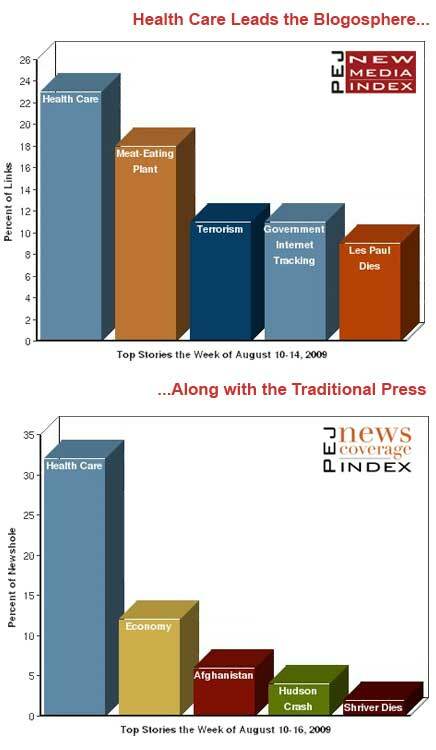 This is the first time health care has been the top subject since PEJ began tracking the blogosphere in mid-January. The previous high water mark was from July 27-31 when health care was the fourth-largest story with 9% of the week’s links. The other top stories in the blogosphere last week were an eclectic mix. The second largest topic, which garnered a great deal of attention at 18% of the links, was a BBC story about the discovery of a large meat-eating plant discovered in the highlands of the central Philippines. The species of plant, large enough to digest rats, was first encountered by missionaries in 2000, but was given the name Nepenthes attenboroughii by botanists earlier this year after the British natural history broadcaster David Attenborough. The third topic (at 11%) was an August 9 Los Angeles Times article reporting that U.S. Attorney General Eric Holder is considering the appointment of a criminal prosecutor to investigate alleged CIA abuses committed during terrorism interrogations. Fourth (11%) was an August 11 Washington Post report that the Obama administration was considering removing a ban that prevented government-run Web sites from using "cookies" and other Internet technologies to track how users interact with the sites, thus raising concerns from privacy groups. And fifth (9%) was the passing of guitar legend Les Paul last week at the age of 94. On the popular Web communication tool Twitter, last week saw a dramatic change in the news agenda when compared to the previous few months. The unrest in Iran received only 2% of the news-focused links from Twitter posts according to the tracking site Tweetmeme. Iran had been the top news subject on Twitter for seven straight weeks, from mid-June until the first week in August (and even then it was the second-biggest story at 23%). With Iran out of the mix, a host of stories vied for attention, most of which were technology-related. Leading the pack (at 16% of the links) was a BBC story noting that Microsoft had announced it would support the popular software browser Internet Explorer 6 through the year 2014, despite critics who have complained about the program’s flaws. The second-biggest topic was news about the economy (15%), but this was then followed by four other technology-related news events. 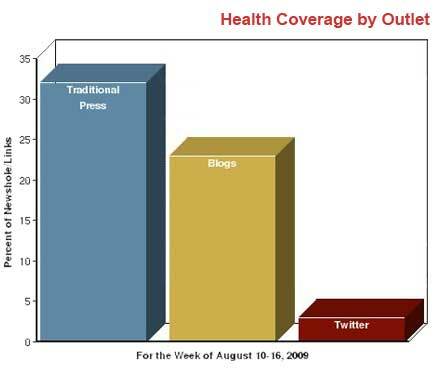 One topic largely absent in the links on Twitter dominated both the blogosphere and the traditional press last week-the debate over health care reform. It accounted for nearly a third (32%) of the coverage in mainstream media and 23% of links from bloggers, but it amounted to just 3% of news-focused links from Twitter. Among bloggers, most of the hostile debate over health care last week referenced two controversial newspaper articles. The first was a July 24 story in the New York Post which generated increased attention this past week. In an article titled "Deadly Doctors: O Advisors Want to Ration Health Care," former New York lieutenant governor Betsy McCaughey, also a leading opponent of Bill Clinton’s health care reform drive in the 1990’s, asserted that some of Obama’s advisors should not be trusted with important health care decisions. McCaughey argued that Dr. Ezekiel Emanuel, brother of White House Chief of Staff Rahm Emanuel, believes in rationing health care and that doctors should look past the interests of their patients to consider society as a whole instead, thus denying coverage to senior citizens and those with disabilities. Conservatives echoed many of McCaughey’s concerns. "The Complete Life Czar, appointed by Der Führer, Dictator Obama, says that doctors take the Hippocratic Oath too seriously, too literally," warned Weekly Currents. "It doesn’t really mean do all you can for your patients. It doesn’t really mean do no harm. Come on! It means do all you can for those whom the government likes." Others, however, challenged McCaughey’s credibility and her article. "Betsy McCaughey is a professional liar," charged Alex Pareene at Gawker.com. "The things she writes are untrue. They are not even ‘distortions.’ They are made-up. Everyone has known this for years and yet she was still allowed to derail the nation this month." The nonpartisan Factcheck.org, a project run by the Annenberg Public Policy Center of the University of Pennsylvania, also weighed in. "We debunked McCaughey’s charges in an Ask FactCheck item we posted today," Annenberg determined. "The short version is that McCaughey has quoted a number of passages badly out of context and twisted their meaning." The second story was by Washington Post business columnist Steven Pearlstein. On August 7, Pearlstein claimed that conservative leaders and their followers opposed to health care reform were promoting misleading and disingenuous attacks. "His piece is probably the best counter to much of the Republican and right-wing spin out there," declared Joe Campbell at 2parse. "He chooses here not to defend health care reform against authentic conservatives or against fiscally conservative objections–but only against those extreme views that are taking hold in the imaginations of those inclinded to be opposed to Barack Obama’s success." "The blatant and not-so blatant sabotage that’s happening in our country today regarding health care reform is nothing short of criminal," added Kevin Charnas." Conservatives saw the piece differently. "As per usual the left want to shut everyone else up and end all discussion, or criticism of their ideas and desires," posted One More Middle Aged White Guy. "Steven Pearlstein, writing a column in today’s Washington Post that is so atrocious you can almost hear the human refuse squishing up through the keys on his keyboard," assessed Lance Burri at TrogloPundit. 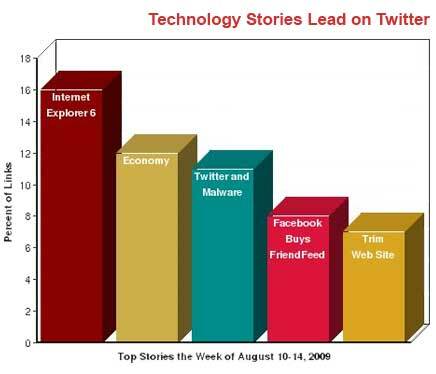 Five of the top six most linked-to news topics on Twitter last week were centered on technology. The only exception was the second-largest subject, the economy, which received 15% of the week’s links. Most of the focus there was to stories about the European economy and to a blog posting that recommended specific credit card deals for students during a recession. The top story, receiving 16% of the links, was the report that Microsoft was going to support the Web browser Internet Explorer 6 (IE6) through the year 2014. Many Twitter users were quite unhappy with this news given their view that IE6 is an inferior program to other browsers. Among the repeated sentiments were "Friends do not let friends use IE6" and "I just heard every web developer on Earth swear at Microsoft: IE6 supported until 2014!" The third subject, at 11%, was a status alert from Twitter posted on August 10, announcing that they were suspending a number of accounts that had been infected with malicious software, otherwise known as "malware." Many used the network to repost the tweet and pass along the information to their brethren. The fourth and fifth stories on Twitter last week involved other Web services. Fourth, at 8%, was a story about the social networking site Facebook purchasing a content-sharing service called FriendFeed. Many industry watchers saw this move as an attempt by Facebook to offer a business challenge to the Web giant Google. Fifth, at 7%, was a report on CNET news that the URL-shortening service Trim was going to shut down. The purpose of services like Trim is to shorten long Web addresses so that they can fit into a 140-character space for use on sites like Twitter and Bitly. The No. 6 subject, at 5%, was a report that Apple was going to reinstate the option to have a matte display on its MacBook Pro computers, something that helps prevent glare on the machine’s screen. None of these technology-focused stories received much attention in the traditional press or in the blogosphere. The most-viewed news videos on YouTube last week also highlighted the rancor that has emerged in the debate over health care reform. Three of the top five videos were of incidents that exemplified how contentious some of these confrontations have been. The top video came from a town hall meeting held in Houston by Rep. Sheila Jackson Lee. The video shows Lee talking on a cell phone while a woman in the audience is telling a story about her own health care experiences. Many people considered Lee’s apparent lack of attention to the speaker rude as evidenced by the crowd’s vocal displeasure and comments made about Lee on various blogs about the incident. The person who posted the popular viral video added a caption that read, "Can’t you see the true concern on her face??? Aw…what a loving elitist…"
The third most-viewed news video was of an incident at a town hall meeting in Missouri where two audience members got into an altercation and police escorted one woman out of the building. Although it is difficult to make out exactly what happened from the video itself, later reports indicated that a man grabbed a poster that included a picture of Rosa Parks from the hands of another audience member and tore it up. The fifth video consisted of The Young Turks, liberal talk hosts, who condemned remarks made by former Alaska Governor Sarah Palin. Palin claimed that, under Obama’s plan, her baby who was born with Down syndrome would be forced to face a "death panel" to determine what type of care he would receive. "That is 100% fiction," the host Cenk Uygur says. "Nobody brings your kids into things other than you, Sarah."